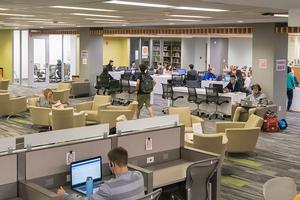 The library’s renovated first floor for individual and group study. Bender Library is committed to the success of the sciences at AU and is a partner in helping make the sciences impactful on our campus and beyond. The library supports the teaching and research needs of our science faculty and students by providing access to the highest quality information in books, journals, and data. It also provides information tools to easily find all of this information quickly and easily. Rachel Borchardt, AU’s science librarian, also creates subject-specific guides to the best library resources throughout the science disciplines, including biology, chemistry, environmental sciences, and more. The library’s support doesn’t end with online tools. Borchardt, like AU’s other subject librarians, is also available for on-demand personal appointments to assist with any research-related questions or assistance in the sciences. Subject librarians can also help with related issues, such as downloading and using citation software programs, or using tools to discover the most impactful journals within a discipline. The library also offers support for faculty wishing to create high-impact research. On May 14, 2018, the library will host its second annual Conference for High-Impact Research, with all-day workshops focused on a number of research-focused topics such as grant proposals, influential social media practices, and peer review practices. Professor of Biology Mark Laubach will serve as one of the featured plenary speakers. The library also hosts other events throughout the year, including a Research in Progress series that showcases research across American University that emphasizes an innovative approach. In addition to supporting research, the librarians contribute to the research output of American University. In fact, Borchardt studies the concepts of impact and impact measurement. She recently co-published an article with Chemistry Professor Matt Hartings in PLOS One, examining the concepts of importance, impact, and metrics within the chemistry field. Borchardt, along with other library faculty colleagues, regularly publishes on diverse topics within library science, including information literacy, usability, accessibility, and open access.